Landscape package 2 – $750 Included Value with delivery. Home / Landscaping / New garden packages / Landscape package 2 – $750 Included Value with delivery. Landscape package 2 – $750 Included Value with delivery. Up to 190 plants! 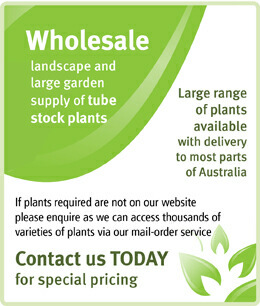 We can tailor a plants package to suit any budget from $100 to $10000. mature size within the same time! Easier/quicker to plant and establish as well! save you time and money looking around for all your plants and ideas. Our 15 year old proven secure mail-order packaging systems with parcel tracking and Insurance give you peace of mind also. Contact us Today or email through your plant list or landscape design and let us take the stress out of sourcing your plants. Prices include secure packaging and delivery with parcel tracking, Insurance and GST. No further discount vouchers or ordering codes can be used on these packages. A discount is offered for orders/packages picked up from the Nursery direct. Landscape package 1 – $500 Included Value with delivery. Landscape package 8 – $7500 Included Value with delivery. Landscape package 5 – $2000 Included Value with delivery.